The hot, quick puffs of breath inside your helmet becom indistinguishable from the distant thumps of the AT-Tes walking above the surface. 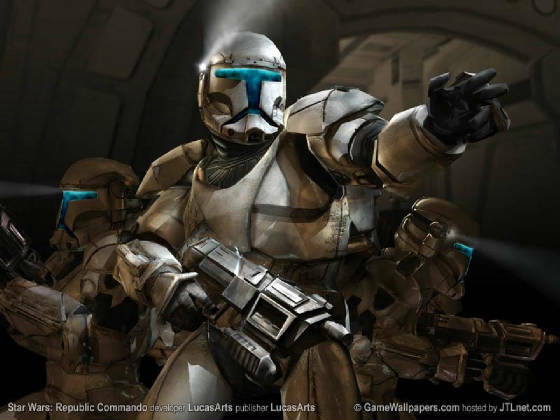 Minutes ago you were riding in a gunship amongst the chaos, fire and smoke blooming in the sky, blaster firespraying up from Geonosis like fountains of colored light..................This is the introduction to the new lucas arts game Star Wars Republic Commando. In this shooter game you control your squad. Your 3 other squad members are extremely intelligent. THis is probably the best squad AI every seen in a game. As Squad leader you can order your squad to perform various tasks. The usual of course Engage target, search and destroy, Form-up, and secure area. But there are also individual commands like telling one of your members to go to the desired sniper location, place satchel on door, breach door, and to heal themself. A wide variety of weapons have been bestowed on Republic Commando. The game introduces some new weapons from the new movie Episode III Revenge Of The Sith. There Are Multiplayer and XBOX Live capability with this game. Featuring games such as Capture the Flag, King Of The Hill, And Regular slayer games. 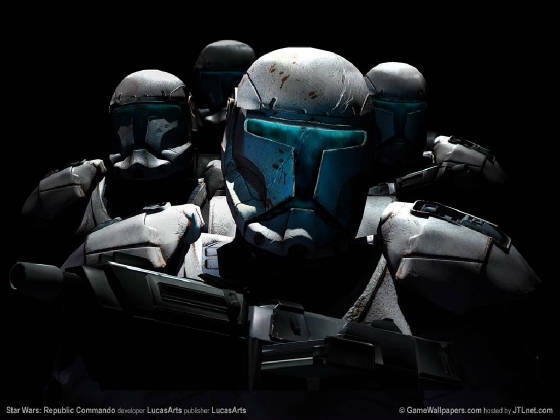 You Can Customize your character being either a republic commando or a Trandoshan. Gameplay is great as well as the graphics. But Multiplayer is lacking some. I wish it was more of a Halo feel.